WildChild Designs was founded in 2015 by established artist, Robin Wood. Robin’s growing reputation for UK-wide public art commissions, community art projects and sculpture trails inspired him to form a company dedicated to creating exciting outdoor play structures, seating, sculpture and adventure trails – all individually hand crafted from local, sustainable timber. Passionate about getting people out into the real world of Nature, Robin Wood, through WildChild Designs, encourages children of all ages to explore and re-discover the joys and freedom of outdoor play. His bespoke play structures and tree houses have been designed and commissioned for the garden, schools, countryside and parkland. Hands in all aspects of the projects, Robin Wood has also translated his creativity for storytelling and illustrations into stimulating adventure trails for the Woodland Trust, Scotland. WildChild Designs offers a full design and construction service for bespoke, site-specific outdoor play equipment, seating and wood carving for both private commissions and public projects. Whatever the project or commission, our philosophy is the same: to reconnect children, families and visitors of all ages to the beauty of natural materials and the great outdoors. Robin Wood is a passionate believer in the importance of exploration and un-tamed outdoor play. The sense of freedom (not to mention healthy exercise) experienced by climbing and play are worth the risk of the odd grazed knee – that said, the safety of our structures is key, as is their durability in all weathers (we are based in Scotland, after all!). All design work is initially visualized with detailed line drawings following in-depth one-to-one discussions about the project, directly with Robin Wood . This allows clients to gain a strong sense of how the finished piece or pieces will look. There is no fee for initial consultations. 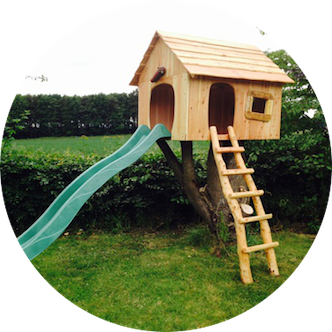 WildChild Designs outdoor play structures and tree houses can be found in numerous backgardens, primary schools, children’s parks and forestry trails. Great fun for children, they can bring out the adventurous inner-child in any adult, too. 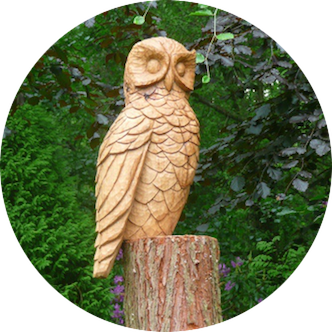 Using wooden sculpture and carving, art trails are a trademark of the work of WildChild Designs. Interpretative and educational designs result in a simple wayfinding path being transformed into something exciting and captivating. 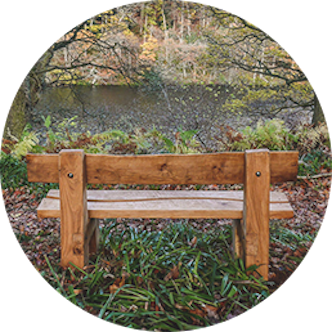 A place to sit, relax and socialize is an important space for a garden or playground, whether it’s a simple wooden bench or a sculptural seating design. Whatever its shape or purpose, our seating is all bespoke, imaginatively executed and hand crafted. At WildChild Designs we are passionate about conserving the environment and unlike mass-producing manufacturers, we ONLY use locally-sourced and sustainable timbers. We tend to work with oak and larch for their outdoor durability and longevity. All fixings used are A2 stainless steel for rot resistance and strength, with recessed bolts and end caps employed where necessary. If required, we can devise a regular maintenance schedule, ensuring the finish and quality of the work for years to come. Designs can be fireproofed, depending on their location. All oils and paints used are high quality, child-friendly and hard-wearing. Robin Wood lives in beautiful woodland in East Lothian, with his young family who have been climbing trees since they could walk. His career has taken such forms as conservationist, forester and tree surgeon before concentrating on his creativity through wood art and craft as a profession, stemming from his passion for illustration. The skills honed through different aspects of his work with trees and nature, including a deep knowledge about natural resources and sustainable forestry, have all proved invaluable for his WildChild Design work.